Dear Friends! Are you interested in Bank jobs? Here is a great opportunity for you to start your career in the public bank sector. 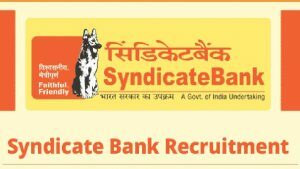 Currently, syndicate bank has released the notification for recruitment 2019. The main aim of the Syndicate Bank Recruitment 2019 is to fill up the vacancies that are available in different positions. Totally, there are 129 vacancies for Manager, Specialist Officer, and other Posts. Syndicate bank is expecting to employ the skilled Indian citizens to carry out the roles and responsibilities of the respective posts. The selected candidates will be placed on the Syndicate banks that are located across India. Candidate should be passed graduation with Mathematics or Statistics as a subject with a full-time MBA in Banking or Finance or its equivalent. Candidates who have passed Full-time M. Sc in Mathematics or Statistics with at least 60% marks and 55% marks for SC/ST/OBC/PWD are eligible for this post. Applicants with FRM/PRM/VFA/Diploma or certification in Risk management will be preferred. The candidates who are applying for the Manager post should be completed CA/ICWA. Post qualification in PSBs/Private Bank in Risk Management/Credit/ Treasury with minimum 1-year experience. Should have experience in SAS/SPSS/other Risk management software will be an added advantage for this post. Must have experience as an advocate with bar council and minimum 3 years of experience as practicing advocate. Minimum 3 years of combined experience as practicing Law Officer in the Legal department of a commercial bank. Otherwise, you may undertake the central/state government as an advocate with Bar Council. The certificates in Offensive security certified professional or Certified Ethical Hacker will be an added advantage. 04 years experience in Banking, Financial Services, Insurance (BFSI) sector, renowned firms/corporate in IS audit. The candidates who completed Cybersecurity, Audit exposure, vulnerability assessment, and penetration testing are preferred. 05 years commissioned service in Army/Navy/air force or a police officer, not below the position of ASP/DSP with a minimum 05 years of service. Applicants with FRM/PRM/VFA/Diploma or certification in Risk management will be more preferable. The candidates who are applying for the Senior Manager post should be completed CA/ICWA. Mode of Payment: The candidates have to pay the application fees online. Step 6: Note down the registration number and password that are provided during the registration process. Step 7: You should hit the “Save and Next” option to verify the details and make changes if necessary. It is not possible to change the entered details after clicking on Final Submit Button. Step 8: Fill the application form with the necessary details and validate it for correctness. Make a click on “Save and Next” Button. Step 9: Upload the scanned photograph and signature as per the given guidelines. Step 10: Make use of the preview tab to preview the entered detail and hit the Final Submit option on the page.